Horsetail creates strong structure and foundation. Touch its leaves and you will feel the rocky texture of silica and other minerals. Horsetails’ masterful roots can dig as deep as 150 feet into bedrock where they dissolve minerals and draw them into their cells. When we drink horsetail leaf tea we are absorbing these minerals and utilizing them to build strong bones, hair, skin and nails. Horsetail also regenerates soil health through depositing minerals onto surface soil. Other names: puzzle plant, scouring rush, Equisetum spp. 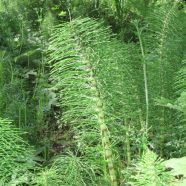 Identifying horsetail: The ancient horsetail family was once the dominant group of plants on our planet, with some varieties growing as large as pine trees. 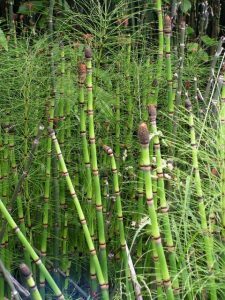 In modern times most varieties only grow a few feet tall, although a stand of horsetail reaching 20 feet was discovered in Australia several years ago! There are currently about 20 species worldwide and they are found on all continents except Antarctica. All varieties have hollow, jointed stems that can be easily pulled apart – hence the name puzzle plant. We have 3 common varieties in Western Washington. Scouring rush (E. Hyemele) has no leaves, only small scales at its joints. It can live to be over 100 years old. Common or field horsetail (E. arvense) grows 1-2 feet tall and has very narrow leaves appearing in a whorl at the top of its jointed stems. 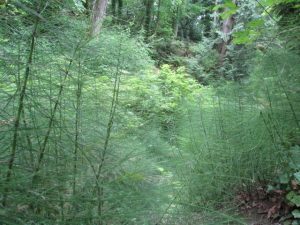 Giant horsetail (E. telmatiea) can grow to a whopping 6 feet tall. Central stalks are much wider and you may see water in each node. In early spring fertile shoots of both common and giant horsetail appear. These tan-colored single stems lack chlorophyll and are almost luminescent. Cone-like tips produce pollen that is mint-green colored. Sterile green plants appear later. 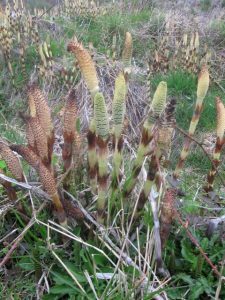 Where it grows: Many species prefer marshy areas, but horsetail can grow in the most unlikely places including waste areas, fields, open slopes, packed gravely soil and even through cement in sidewalks. 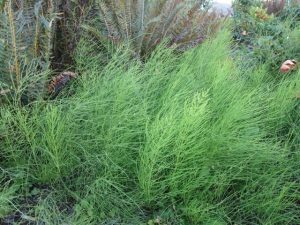 Horsetail often emerges in places where topsoil is removed or disturbed – a remarkable expression of nature taking care of herself. 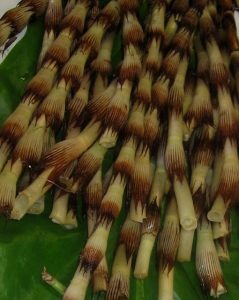 Horsetail has two spring offerings: the tan-colored fertile shoots that appear early in the season are edible. Later, the green stalks of horsetail appear as a separate plant. These can be used as medicine, but are not eaten. Young fertile shoots are considered a delicacy among many Coast Salish People. Pinch off stem close to the ground, peel off the brown papery sheaf around each node, and then pull off the top cone. The tender growth between the nodes is eaten fresh and is traditionally dipped in oil. It can also be cut up and added to soups or sautes. Each node of the stem stores water, especially in giant horsetail. You can cut the top off each node and drink the delicious liquid inside – Nature’s original mineral water. One friend from Makah explained how he takes a narrow stick, inserts it in the top, and pushes down through each node, leaving the bottom one intact. With this technique he can drink all the water in the stalk at once. Spring green tops are gathered when the leaves are still vibrant green and pointing upward or outward– usually between March and July. As the plants age, leaves begin to droop and turn army-green. Silica crystals in the leaves become more developed and less water-soluble – and therefore, less useful for human consumption. Horsetail is tricky to dry because it contains a lot of water. Dried plants should look green – not brown or silvery. Bundling them and hanging them in a place with good airflow works well. Once they are completely dry, they pull apart easily like puzzle pieces. Then, you can rub them between your hands to make them smaller. The stems can be cut in to small pieces with scissors. Dried horsetail lasts about a year, or as long as it retains its color and smell. Horsetail is a tonic remedy that strengthens tissues of the body including the lungs, sinuses and kidneys. The tea is high in quercetin, an anti-inflammatory compound that stabilizes mast cells that become easily inflamed during allergic reactions. 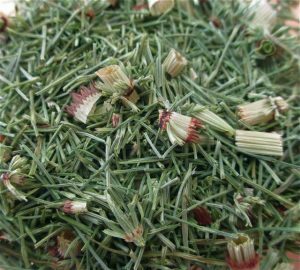 Horsetail is an excellent daily tea for people with asthma, especially when mixed with mullein leaf. It strengthens lung tissue and prevents inflammation, while mullein helps to remove congestion and increase pliability of lung air sacks. Horsetail has also been used for treating bronchitis and tuberculosis. In Mexico the plant is highly regarded as a tonic to improve both the structure and function of the kidneys and the bladder. Frequent consumption of horsetail tea during an acute urinary tract infection may decrease discomfort and burning sensations. It is a safe tonic for chronic urinary conditions, and can help increase resistance to infection. Horsetail contains more than 35% silica – a compound that helps to strengthen connective tissue including bones, cartilage, skin, hair, nails, mucus membranes and arteries. Silica capsules derived directly from horsetail are available in health food stores. I have known several menopausal women with hair loss that noticed an increase in hair growth from taking the capsules. One friend sent horsetail to her uncle to help strengthen his kidneys. Several months later he called her and asked what magic remedy she had been giving him… his receding hairline was filling in with new hair growth! Homeopathic Silicea from horsetail is also used to rebuild strong connective tissue. Horsetail has a mild vegetable broth-like flavor. 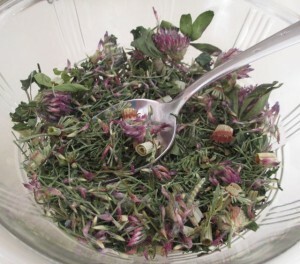 Prepare a strong infusion with a large handful of herb per two to three cups of water. Steep 15 minutes to several hours. Drink 2-3 cups a day on a regular basis. Horsetail combines well with other herbs. A popular tea at the Northwest Indian Treatment Center is our Healthy Skin, Hair, Bones and Nails Tea. It contains equal parts horsetail, red clover, stinging nettles and peppermint. One heaping tablespoon of this mixture is steeped in a cup of boiled water for 15 minutes to several hours. Delicious! Horsetail is used cosmetically as a hair wash and a skin tonic. Silica in the plant binds to hair or skin proteins and serves as a protector and strengthener. The tea can be applied topically for recovering from sunburn or for poor quality skin with premature aging. Boil 6-8 cups of water in a pot. Turn off heat, then add about a cup of dried horsetail to the hot water. Let it cool to a warm temperature and then strain into a second pot or large bowl. Compost the horsetail and bring the tea and the original pot to a sink or the bathtub. Bend over and place the empty pot under your head. Pour the tea over your hair. If it is long, you can let it sit in the tea in the bowl beneath you. Switch containers and pour the tea over your head several more times, then towel dry hair. This rinse makes your hair feel silky and look shiny. Horsetail green stalks should not be eaten raw. They contain thiaminase, an enzyme that destroys thiamine or vitamin B1 stores in the body. This is especially problematic for grazing horses that seem to love it. Cooking or drying the plant destroys this enzyme. Be careful not to gather horsetail in areas where water drains from agriculture or industry. Inorganic nitrogen compounds are absorbed into the plant and create less toxic alkaloids from them including nicotine and acanatine, which are harmful to the body. Scouring rush refers to the silica-rich stems that pioneers used as wilderness pot scrubbers. Knights were said to shine their armors with horsetail. It is superior to the finest grades of steel wool and has been used by Native American woodworkers to produce a smooth finish. I know some contemporary woodworkers who still use it – and the results are amazing. It makes wood glassy, yet retains a soft texture. Memories of horsetail radiate throughout my childhood. I remember walking through patches of giant horsetail and giggling as the tiny leaves tickled my skin. It felt like a brush passing over my whole body. Stalks transformed into animal tails and soft downy material for nests. Horsetail also felt fossil-like – a relic of ancient times when wholly mammoths wandered the riverside and humans discovered plant technologies. I peeked over their stalks into the wetland to search for Paleolithic birds. It was thrilling have a living experience of ancient history.